Back in 1905, the industrialist Pierre du Pont endeavored to save a collection of trees that were to be sold as lumber. According to Longwood Gardens, du Pont invested to create a”horticultural showplace” and since that time, the garden administrators have worked to apply innovative sustainable practices. The plants shown in their seasonal displays are composted at Longwood, producing soil for future displays. The Gardens’ Integrated Pest Management Program uses natural means to manage pests whenever possible and in order to conserve energy, there is a cutting-edge root-zone heating system. This enables the indoor plantings to receive heat without it escaping into the ambient air. Now the garden is showcasing another type of sustainability through the large scale installation art of Bruce Munro, a British light architect. Munro’s work is focused on enhancing the natural world and he does so through the use of recyclable items such as plastic water bottles and compact discs. Photos diminish the magic captured in the air around Bruce’s work. I fear the nighttime was also a challenge. Take a look and I hope it inspires you to pop on over to Longwood Gardens website or better yet, to go out and see it. Lovely. I look forward to learning more about Longwood Gardens (and, I hope, visiting some day). For a few years–around 2004-2006, I received a subscription to a lighting design trade magazine. I think it was because I’d done some freelance writing about that industry. It was fascinating to learn about the art and science of lighting design. Before then, I’d never thought much about lighting as an element of architecture or art (outside of filmmaking and theatre). Since those years, I’ve taken a much more active interest in aspects of light in architectural design and the role of light in my own life, office and home. It’s really fascinating. Thanks, as always, for sharing these stories and insights, Tammy. You’re welcome. Light is fascinating isn’t it. I went to a lighting seminar once and I was amazed by what I learned about ways it can influence your living inside a home. Tammy, I live not too far from Longwood Gardens, and it is truly an amazing place. One of my favorite experiences there was taking my wife to a “Harvest Dinner” for her birthday in October of 2010. It was a wonderful spectacle of beauty and bounty. It was a perfect crisp evening. They started us in one section of the garden with hors doerves while a classical guitar player accompanied us all. Then we kept moving to stations, finally as the sun set and the moon was rising we came to an enormously long single table that seated all of us (maybe 100 people?). They served a delicious meal and drank wine and chatted and laughed with all of the folks seated around us… Instant community. What was also special was that I was seated right next to the new Director of Longwood Gardens, and got to know him a little bit. What a great memory you’ve stimulated tonight! That dinner sounds amazing. That new director (I believe his name is Paul) will be here in AZ for the American Public Garden Association meeting and I look forward to getting to know him also. I was so very privileged to be included in this special Longwood tour. That sounds like a PERFECT Harvest Dinner and garden stroll! This fascinates me, Tammy. I keep wanting to look at what I have and instead of pitching it or even giving things away . .. to think what else I could create with it or from it. To re-purpose it. Thank you for sharing this amazing place! You should check out pinterest sometime Debbie. It is full of repurposing ideas. Of course, it is another way to spend a lot of time in front of the computer. Its light, its soda bottles, what’s not to love! So trippy! I am loving this idea. Bravo!!!! As usual, Agrigirl, you simply amaze us with beauty in the ordinary! I always wanted to see Longwood’s Dancing Waters, but this upcycled art rather rivals Chihuly! With Pinterest, it has become so easy to learn about DIY ideas and upcycling! In the 70’s, I striped canisters of film with bleach so my 1st graders could color the blank film with permanent markers. When we ran it through a projector, we had a magic lightshow for our creative writing class. Guess I’m just an upcycled Berkeley flower child at heart! I haven’t been there in years but now it’s on my list of things to do again soon! Thanks! I hope you might be able to see it while this exhibit is there Kathy. It’s amazing. Gosh, that is absolutely lovely. Thanks for the ideas! I understand there are people in India and S. America that use plastic soda and water bottles in the roofs of homes without electricity, for natural light. Genius. I would love to see this light show you shared! I bet that is true Sally – a great vehicle for a sky light. If we still lived in Maryland . . . I would head over to Longwood Gardens today . . . or maybe tonight. Definitely this week. This one is definitely a night venue. Thank you for another enlightening post! I was unfamiliar with Longwood Gardens, but have now checked out their web site with great interest. Up-cycling has always been an interest of mine, and I am thrilled to see this wonderful work. Lovely! Absolutely lovely! Wonder if the exhibit will ever make it to our Botanical Garden here in Phoenix? It looks so soothing. Thanks for sharing! Maybe, just maybe you will see it. If she is near, it is very worth it. It looks quite wonderful, Tammy! A magical place! Really a magic night Kate. Warm, dark, and then the fog rolled in. 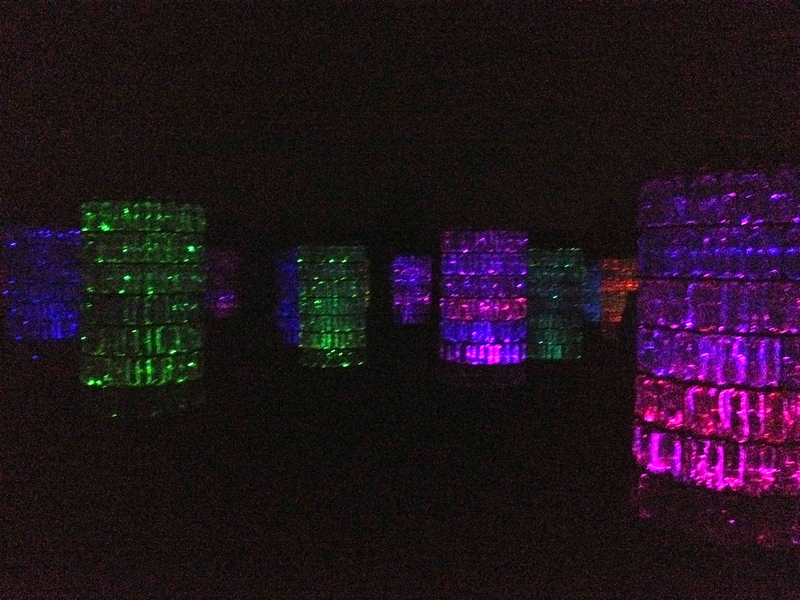 thank you for introducing me to Bruce Munro and his fantastic work with light. I would love to spend time at his installation. Wondrous! and his mission, with which you begin your post, is both eloquent and uplifting. Yes, he’s a very inspirational fellow. We were so lucky that he was present for our tour. This is his first solo show in the U.S. although he did a smaller group show at the Guggenheim a couple of years ago. I drool over this light show. Could we have fun with this on our island! Light brings out the best in us. That is so funny Amy! My MIL lives on an island south of you and she said the EXACT same thing. One day, I am coming up and we are all going to get together! Does your MIL have access to Bill Gates’ yacht? That would make a perfect way to get together! I love Longwood Gardens and would love to see Bruce’s work. Alas, I’m not going to make it out that way in time to see the exhibit. Thanks for sharing it through your photos. It looks beautiful. Maybe it will travel your way! Sooooo creative! Must be simply amazing to see in person! I was just there for the dahlia show… unfortunately we had to leave before it got dark. I was disappointed to miss the forest walk, particularly.